In the small town of Cut Bank, Montana, car mechanic Dwayne McLaren (Hemsworth) dreams of leaving town with his girlfriend Cassandra (Palmer), but he hasn’t got any money and he has to look after his disabled father (O’Hare). While spending time together on the outskirts of town, Dwayne inadvertently films the murder of local postman Georgie Witts (Dern). He takes the footage to Cassandra’s father, car dealer Big Stan Steeley (Thornton), who calls in the sheriff, Roland Vogel (Malkovich). The sheriff watches the footage and declares it’s the town’s first murder. With the community in shock over Georgie’s death and the disappearance of the mail van he was driving, Vogel begins his investigation. At the same time, a loner with a strong interest in taxidermy named Derby Milton (Stuhlbarg) comes looking for a parcel he was expecting (and which was in the mail van). Where Vogel looks for a vehicle with a particular set of tyres, Milton looks for a boot with a particular sole. He finds out that a Native American named Match (Burke) bought a pair a few months before. Meanwhile, Dwayne applies for a reward due for evidence relating to the death of a member of the postal service. The reward – $100,000 – will allow Dwayne to find alternative care for his father, and give him and Cassandra the chance to start a new life together in California. But when the Postal Inspector (Platt) arrives to confirm the reward, there’s only one snag: he needs to see the body, which so far hasn’t been found as it was taken with the mail van. 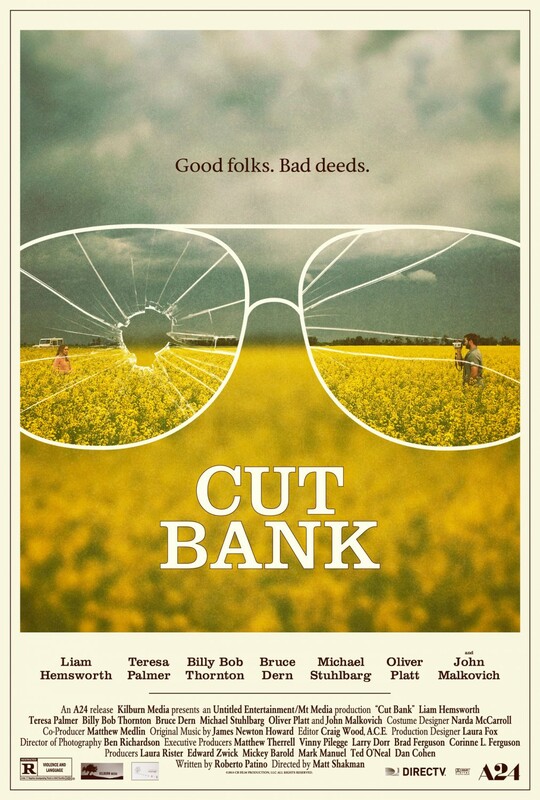 Watching Cut Bank, the obvious comparison is with Fargo (1996), but while that movie is still highly regarded as a classic nearly twenty years on, it’s hard to believe that Cut Bank will be looked on in the same way, or remembered at all. While it does its best to look and feel as moody as many other small-town crime dramas, it’s the quality of the story that lets it down. There are too many occasions where the story is driven forward by the messiest of contrivances, or characters behave in ways that contradict their previous attitudes. For the viewer it means a suspension of disbelief that is needed on several occasions, and for which the movie makes no apologies, as it just carries on digging a bigger and bigger hole for itself. Indeed, it’s the script by Roberto Patino, and as directed by Shakman, that proves the movie’s downfall, causing as it does a loss of faith almost from the beginning. It plods through its twists and turns with all the authority of a movie that doesn’t know where it’s going or why – and which winds things up with one of the worst, most nonsensical outcomes that anyone could possibly imagine (except Patino). To say that it defies belief would be to suggest that the viewer might actually have some by this point. And as for some of the dialogue, the script aims for clever and insightful, but succeeds in being arch and unimportant. Only the running gag, “I thought you were dead” works as well as it should, and at one point it receives a great pay-off, but it’s the only aspect of the script that really hits home. With the script being so derivative and uneven, the movie suffers and so too does its more than talented cast. Hemsworth proves once more that he’s the blandest of the Hemsworth brothers, and still has trouble being convincing as any character in any movie, while Palmer has an embarrassing pageant song to sing and dance to but very little else. Thornton portrays Big Stan as the same kind of no-nonsense bully he’s played so often before, and Malkovich gives possibly the best performance as the sheriff who looks to be so out of his depth that he can’t see the bottom. Of the rest of the cast, Dern is great but not well-used, and Stuhlbarg is given a monologue that attempts to explain his behaviour but which actually proves too confusing to be much of an explanation. And Platt breezes through his scenes with all the bluster that he’s employed elsewhere, but here, it’s all to no effect, and his character adds nothing to the mix. 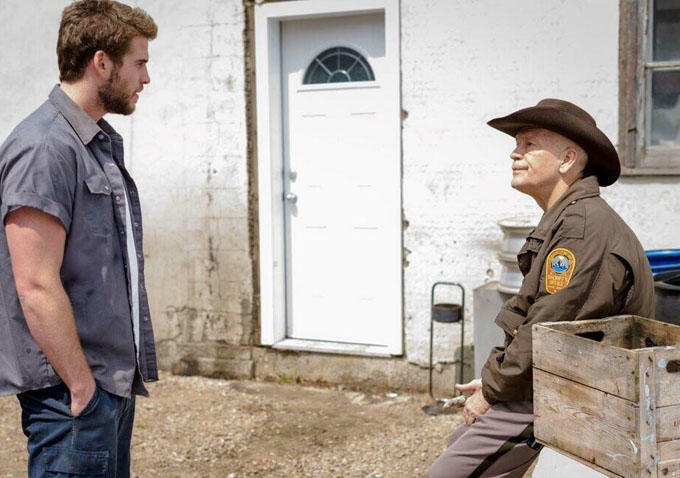 Shakman orchestrates the various plot strands and characters with the confidence of a director who doesn’t quite know what to do with the material – which is strange as he directed two episodes of the TV version of Fargo (2014) – but again it’s the quality of the material that hampers him. He does display an appreciation for widescreen composition, but he never seems comfortable presenting any close ups, and appears content to work with medium or long-range shots instead. This creates a distancing effect between the audience and the characters, and before long, the viewer has lost all interest in what’s happening, or how important it might all be. This applies particularly to Milton’s basement “secret”, which, when it’s revealed, is never adequately explained (though an attempt is made with Milton’s monologue). It’s the movie’s one true moment where it pulls something out of the bag that’s different and entirely unexpected. In failing to live up to its potential, and by wasting the talents of its cast, Cut Bank stalls and stutters so often, and finds it so difficult to maintain a convincing approach that in the end it becomes too frustrating to watch, and is so undermined by its cavalier attitude to law enforcement and guilt, that it never recovers. The plot lacks originality, and the characters lack any appreciable depth, often doing things without any clear motivation. That said, there’s supportive and beautiful cinematography by Ben Richardson, and while some scenes appear to run on too long, the editing by Carol Littleton is sharp and keeps things moving (when they should be stalling). Rating: 4/10 – with a script that tries to be clever and ingenious, but falls short on both counts, Cut Bank is left to founder in almost every area; one to avoid unless the idea of a murder mystery that leaves out the mystery is an attractive one that you can’t pass up. NOTE: The trailer contains a few spoilers that aren’t included in the above synopsis, so if you watch it, please bear this in mind.